A lecture by Professor Diarmaid Ferriter of UCD on the topic of his recently published book about the history and possible future of the border between the Republic and Northern Ireland. 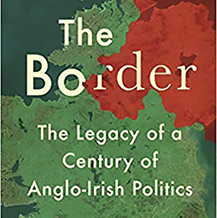 The book, The Border: The Legacy of a Century of Anglo-Irish Politics, is described by the publisher as ‘a timely intervention into one of the most contentious and misunderstood political issues of our time’ and the subject is sure to be of much interest locally given Louth’s border location. The lecture will be held on Thursday 21 March 2019 at 8.00pm in St Vincent’s School, Dundalk. The lecture is open to all. Voluntary donations at the door are welcome to support the work of the Society. This lecture is jointly organized by the Society and the County Museum.